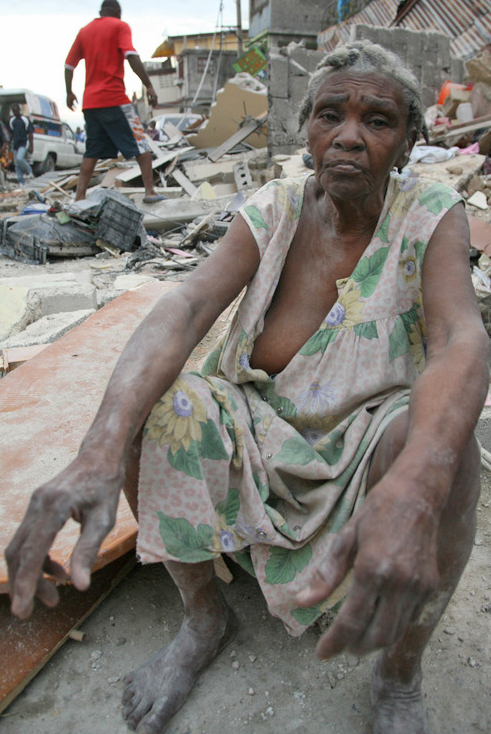 A woman sits among the rubble of Haiti’s earthquake. WINNIPEG – Lutheran Church–Canada (LCC) leaders are asking congregations nationwide to contribute immediately to a Haitian earthquake-relief effort. Robert Bugbee, LCC president, called Tuesday’s 7.0 magnitude earthquake “catastrophic” and said the synod forwarded funds Wednesday to Canadian Lutheran World Relief (CLWR). CLWR focuses its efforts on international emergency relief, development programming and refugee resettlement and is working with Action by Churches Together (ACT) Alliance to meet Haitians’ basic needs following the disaster. “On behalf of Lutheran Church-Canada pastors and people across our country, I express the sorrow and horror our members feel at the catastrophic earthquake in Haiti,” said Bugbee. “The basic needs of all Haitians – regardless of their religious affiliation – are a serious matter and need to be addressed immediately. According to a press release, CLWR has already forwarded $10,000 towards the first phase of ACT’s response. Located southeast of Cuba and on the island of Hispaniola, Haiti is a country of about 9 million people – 80 per cent of whom live in poverty. On Tuesday, a 7.0 magnitude earthquake struck along the Enriquillo-Plantain Garden fault zone. Its epicenter was about 16 kilomeres southwest of Port-au-Prince, the country’s capital and home to some two million people. Nobody knows how many people are dead and unaccounted for, but on Wednesday, Felix Augustin, the country’s consul general to the United Nations, said Port-au-Price had been flattened and more than 100,000 people could have been killed. International relief efforts, including efforts organized by Canadian Lutherans, are now well underway. “We carry special concern for our Lutheran churches and mission partners in Haiti, who were already labouring under trying circumstances because of the poverty in their country, and because of hurricanes and tropical storms which had caused so much destruction in recent years,” said Bugbee. He said individuals can donate to the relief effort by visiting www.clwr.org/donate. In the process of completing the form, donors will come across a pull-down menu that allows them to designate a specific project. Call (204) 694-5602, or toll-free at (800) 661-2597 to contribute by phone. Bugbee said LCC will soon forward prayer resources to member churches across Canada thanks to the help of Dr. John Wilch, of St. Catharines, Ont. Wilch is the president of the Haiti Lutheran Mission Society (HLMS), an organization affiliated with LCC. “In the meantime, in your churches and individual homes, I ask you to join with us in the national office in praying God to clear the way for us to act as His hands to help and heal and restore,” said Bugbee. i feel so sorry for haiti and we need to donate to haiti we take things for granted and we just waste our money when poor countries like haiti and malawi need the money expecaly haiti so please donate your money to haiti and do a good deed. Thank you for your encouraging words. There is a lot of work to do in Haiti and in other developing nations. May our Lord move us all to continue providing financial support.